Since its launch in 1998, the Leadership in Energy and Environmental Design (LEED) program has become widely accepted as the standard measure of sustainability for buildings. To date, almost 21,000 projects, representing more than 5 billion square feet, have registered their intent to seek certification under the system. Another sign of the program’s success is the long list of municipalities, state governments, and federal agencies that have adopted LEED, incorporating it into construction guidelines, legislation, and requirements for incentive programs. Along with this market acceptance have come the inevitable growing pains. Users complain about confusing documentation requirements and project review delays, while some critics say that the system, developed through a consensus process, is not backed by enough hard science. Although its creator, the U.S. Green Building Council (USGBC), has done much to respond to these criticisms as it developed and expanded LEED in recent years, it is now in the process of an extensive overhaul—one that it hopes will maintain the program’s rate of market uptake while advancing its technical rigor. “We were cognizant that LEED works now, but that it could work better,” says Brendan Owens, USGBC vice president of LEED technical development. The revamp initiative, which the council refers to as LEED version 3.0, or LEED v3, has several components: revisions to the green building rating system, updates to the online tool that supports project certification, and changes to administration of the certification process. It also includes a new program for accrediting the professionals who work on LEED buildings. LEED 2009 (the title given to the rating system component of the v3 effort) went live on April 27. 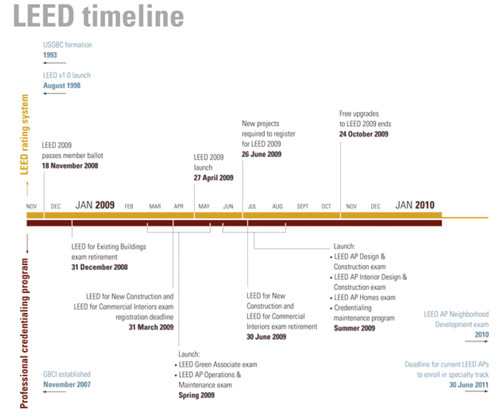 And when long-time users register new projects, they may notice adjustments intended to more closely align the many rating systems that fall under the LEED rubric, including a version targeted at operations and maintenance, called LEED for Existing Buildings; one tailored to the design and construction of speculative buildings, known as LEED for Core & Shell, and the oldest and most widely used system, LEED for New Construction. This “harmonization” process includes revising similar credits in the various systems so that they cite the same standards and use the same language. This change should make LEED more user-friendly, especially for people who work on multiple projects of diverse types simultaneously. “A personal frustration has been the subtle differences between credits with the same title and the same intent,” says Joel McKellar, Assoc. AIA, a researcher at Charlotte, North Carolina–based LS3P and author of the blog reallifeleed.com. As part of the effort to provide consistency, LEED 2009 moves to a 100-point scale, with regional and innovation credits providing an opportunity for projects to earn up to 110 points. Previously, the individual rating products each had their own point totals. For example, LEED for New Construction, LEED for Schools, and LEED for Commercial Interiors were based on 69-point, 79-point, and 57-point scales, respectively. LEED 2009 also introduces uniform certification thresholds across all the rating systems. Projects that earn 40 points will qualify for certification at the lowest level. A minimum of 50 points is required for Silver certification, 60 points for Gold, and 80 for Platinum, the highest level of certification. The alignment of the individual rating systems, along with the new thresholds and the introduction of the 100-point scale, should simplify the documentation and certification process. In addition, they also help establish a framework that can accommodate more building types and market-specific requirements over time. However, the goals of the overhaul are more ambitious than streamlining and rationalizing the system. The larger aim was to provide incentives for project teams to deploy those strategies with the greatest potential for environmental or human-health-related benefit, with greenhouse-gas reduction at the top of the priority list. “LEED 2009 emphasizes the critical issues of energy, transportation, and water, and makes them the most important,” says Rand Ekman, AIA, director of sustainability at OWP/P, Chicago. This prioritization is achieved by redistributing points among the various LEED credits to emphasize some over others. To formulate this reallocation, USGBC staff, committees, and consultants started with an inventory of 13 aftereffects of human activity created by the U.S. Environmental Protection Agency (EPA) and known as “TRACI.” Short for “Tool for the Reduction and Assessment of Chemical and Other Environmental Impacts,” TRACI includes categories such as fossil-fuel use, ozone depletion, and global warming. Next in the reallocation process was prioritization of the TRACI categories. To assign a relative importance to each, the LEED 2009 team relied on a tool developed by the National Institute for Standards and Technology (NIST). Ultimately, the council created a matrix that established the relationship between existing LEED credits and the TRACI categories. The matrix served as the basis of a spreadsheet for calculating the number of points each credit is worth. Energy and transportation credits came out as big point winners in this analysis, primarily because of the importance assigned to controlling carbon emissions. For example, strategies intended to increase energy efficiency and the reliance on renewable power generated on-site can earn projects up to 26 points, versus 13 when compared to the previous LEED for New Construction. A location close to public transportation, which also has the potential to reduce occupants’ energy use, counts for six points, up from only one in the old system. Some credits with a less direct link to slowing global warming also have heavier emphasis in LEED 2009. For example, ambitious water conservation goals can help garner as many as 10 points, double the number previously available. However, review of the new rating system does reveal a few significant credit adjustments. 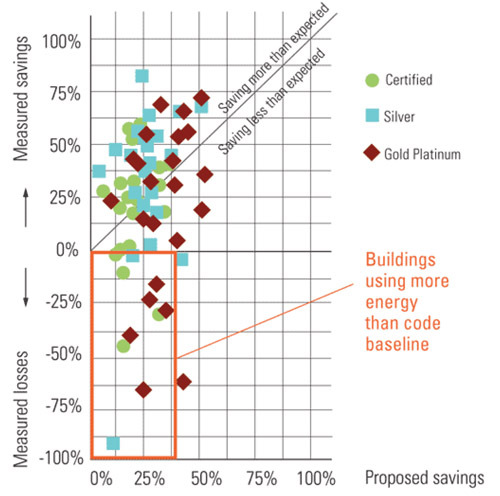 For example, LEED previously awarded points for indoor water-use reduction beyond 20 percent when compared to a “baseline,” or code-compliant, building. But in the new system, this savings level becomes a prerequisite. Projects earn no points for satisfying this performance minimum, but those that do not comply will not be eligible for certification. To earn points for efficient indoor water use, projects must achieve at least a 30 percent reduction. These new water thresholds are achievable and appropriate, according to Anica Landreneau, Assoc. AIA. “It is possible to reach 40 to 50 percent savings with fixture selection alone,” adds Landreneau, sustainable-design-practice leader in HOK’s Washington, D.C., office. Another notable change is the introduction of regional credits. For the first time, the rating system will take into account environmental issues important in projects’ specific locations. Working with its local chapters and affiliates, the USGBC has identified credits that address the priorities of given environmental zones. Projects will be able to earn a maximum of four bonus points on top of the base 100 for achieving these preselected credits. For example, projects in rural areas of Michigan can earn extra points for preserving agricultural land, reducing light pollution, and minimizing storm-water runoff into the Great Lakes. The council considers this bonus-point approach as an interim step. It hopes to eventually incorporate the regional priorities into the body of the rating system. “But this is two or three versions down the road,” according to Owens. 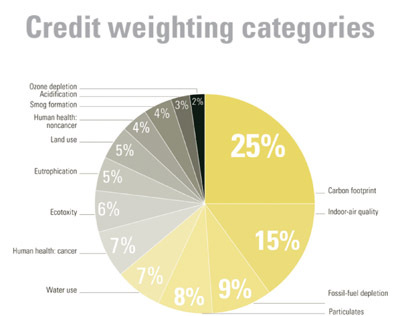 One aspect of LEED 2009 should help the USGBC with a long-term goal of better understanding the relationship between credits and building performance. As part of project registration, teams will need to agree to report post-occupancy energy and water use. There will be a number of ways to fulfill this provision, including participation in the existing buildings program, which has a performance measurement requirement, or signing a waiver that would allow the USGBC to obtain the information directly from the utility company. The council hopes to use the data to perform studies like the somewhat controversial one it commissioned from the New Buildings Institute (NBI). Completed in March 2008, the NBI analysis determined that energy use in LEED buildings is 25 to 30 percent better than the national average. However, it also showed large variations among individual buildings. According to one of the study’s analyses, 25 percent of the participating projects had better than expected performance, while 21 percent showed performance that was below the code baseline. The study also highlights a problem that is just as important as its findings: the difficulty of collecting performance data. NBI’s examination is based on 22 percent of the 552 buildings that had been certified under LEED for New Construction Version 2, through December 2006. Only these 121 projects were able to supply the full year of post-occupancy energy numbers required for participation in the study. Collecting the data for even this small pool of projects required “an extraordinary level of effort,” according to Owens. The hope for the new reporting requirement is that it will “automate the collection of data to inform the future development of the rating system,” he says. The LEED v3 launch also includes an improved tool for managing the project registration and certification process electronically. The council, in collaboration with software companies Adobe and SAP, developed the application in response to complaints that the system’s predecessor is slow, buggy, and prone to frequent crashes. “The USGBC staff uses it on a daily basis, so we are aware of its shortcomings,” says Mike Opitz, USGBC vice president of LEED development. System designers also sought input from other frequent users, such as project administrators and reviewers, he says. The new LEED Online, which will be available for use only in conjunction with LEED 2009 projects (those registered under previous versions of LEED will be required to continue to use the older online system), represents an investment of “several million dollars,” says Opitz. In addition to providing improved speed and reliability, the application is designed to facilitate communication between the reviewer and the project team, according to the council. Along with the revamp of the rating system and the online application, LEED v3 includes an overhaul of the project certification process and the program for qualifying LEED Accredited Professionals (AP). In conjunction with the v3 launch, the USGBC officially moves administration of the certification and AP programs to the Green Building Certification Institute (GBCI), a nonprofit organization spun off from the USGBC in late 2007. The council will continue to manage the development of the rating system, the online tool, and related resources such as educational offerings. For the certification piece, GBCI will manage 10 organizations, including Underwriters Laboratories and Lloyd’s Register Quality Assurance, which will in turn oversee the project review process. Under the old system, all LEED project submissions were reviewed by the USGBC with the support of independently contracted reviewers. According to USGBC and GBCI, the administrative restructuring should eliminate the review and certification delays that have long plagued the LEED program. In addition, the two organizations say the changes will bring the program in line with the protocols of the International Organization for Standardization (ISO) and the American National Standards Institute (ANSI). Certification will “become a real third-party process,” says Horst. Also being closely watched by the green building community are the coming modifications to the AP program. The changes, which will be phased in over the coming year, include introduction of a three-tiered system of credentials. The lowest tier will be LEED Green Associate. It is intended for people who want to demonstrate a commitment to green building practices but may not be directly involved in LEED projects. GBCI expects that this title will appeal to non-technical professionals, such as marketing staff in design firms or lawyers involved in real estate development deals. The second tier will be roughly the equivalent of the current AP credential, but will include specialty tracks that correspond to the various LEED rating systems. Finally, LEED Fellow will designate an “elite” level of expertise. The new credentialing is a response to concerns that passage of the current multiple-choice qualifying exam requires rote memorization rather than a true understanding of green building practices and principles. “The goal is to make sure that the credentials are targeted and meaningful,” says Peter Templeton, GBCI president. Although GBCI is still developing the criteria for fellow status, it has already outlined the requirements for the first two tiers of accreditation. Earning the Green Associate credential will involve passing an exam that will cover core concepts and the key points of the LEED rating system. Qualification for the AP status will have two steps: Candidates will be required to take the first-tier exam as well as a test tailored to their chosen specialization. In addition, AP hopefuls will have to demonstrate LEED project experience. GBCI plans to institute continuing education requirements for both designations—15 hours for Associates and 30 hours for APs, biennially. The more than 101,000 people who have passed the current exam, and the many more expected to successfully complete the test before GBCI discontinues it at the end of June, will be permitted to retain their AP designation. They will also have the option of enrolling in the new system. But in order to adopt one of the specialized credentials, they will need to complete the continuing education requirement. GBCI hasn’t yet provided the details of what kind of courses will count, except for noting that 6 of the 30 hours will need to be “LEED specific.” However, many observers expect that satisfying the requirement will be relatively painless, at least for professionals who participate in continuing education in order to maintain their licenses. “For architects and engineers, there will be overlap,” predicts McKellar. “But from those [disciplines] that don’t already have to complete continuing education, there will be resistance,” he says. With regard to changes to the LEED program as a whole, the reaction of seasoned LEED users has been mostly positive. Many design consultants say that the new system should not be a huge adjustment for project teams. “Obviously there will be a learning curve,” says Rob Bolin, a senior vice president with mechanical engineering firm Syska Hennessy in Chicago. “However, if people are completing LEED projects now, they will be able to continue to do so in the future,” he says. Information Graphics: Encarnita Rivera; Data: USGBC, except as noted. Originally published in the May 2009 issue of Architectural Record. Comparison of new and old point systems. Certification thresholds: LEED 2009 introduces uniform certification thresholds, based on multiples of 10 points, across all its rating systems. They replace the older versions’ seemingly arbritrary point requirements. 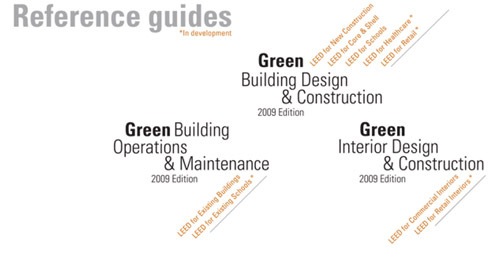 Reference guides: The revamping effort includes revising credits that resemble each other in the multiple LEED products so that they rely on the same language. A manifestation of the “harmonization” process are the reference guides, which provide supporting documentation to the rating systems. The new guides group similar LEED products, reducing nine systems to three volumes.